Congratulations and welcome! By visiting this page you've taken an important step in your role as a caregiver. Lotsa Helping Hands is a private, web-based caregiving coordination service that allows family, friends, neighbors and colleagues to create a community to assist a family caregiver with the daily tasks that become a challenge during times of medical crisis. By creating a community you're literally pulling "lotsa helping hands" together to share caregiving responsibilities. 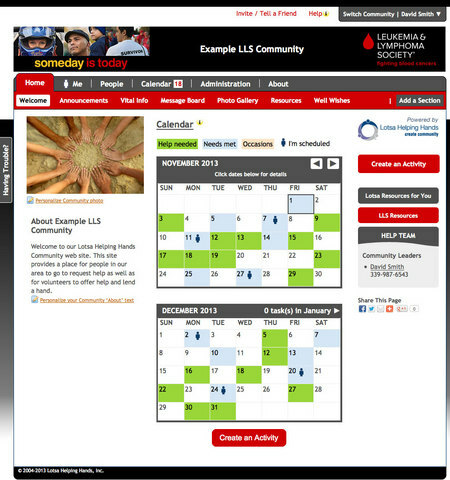 Each community includes an easy-to-use group calendar for scheduling tasks such as meals delivery and rides, a platform for securely sharing vital medical, financial, or even legal information with designated family members, and customizable sections for posting photos, well wishes, blogs, journals, and messages of support. With a community web site in place, when someone asks “What can I do to help?” the answer is “You can join our community!" Then ask them for their name and email address – the system takes over and allows people to sign up and start helping.